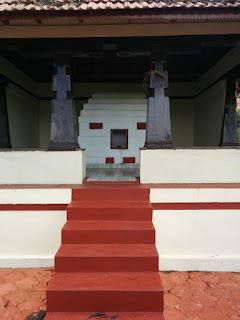 In the northern part of the Mahadevapet quarter of Madikeri town is located Gaddige. Gaddige, the royal graveyard, is a set of three regal mausoleums built in the Indo-Saracenic style and enclosed within a compound. Upon each of these rectangular structures is a large dome and four turrets. Two kings of Kodagu and their chief queens lay buried in the two larger identical structures. A third smaller one has the remains of the chief preceptor of the kings. 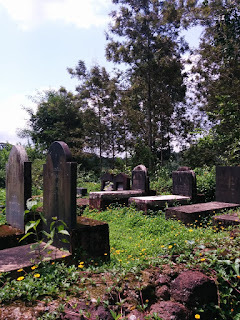 Beside these three tombs, a little distance away and within the same enclosure, are the tombs of the father-son duo Biddanda Bopu (1769-1807) and Biddanda Somayya (1800-1879). These two personalities had served Kodagu and its Rajas as the Sarva-Karyakaras, or army generals. While Bopu was the general under Dodda Vira Rajendra (r.1789-1809), Somayya was the general under Chikka Vira Rajendra (r.1820-1834). Each of these two tombs have the statue of a Nandi bull upon it. 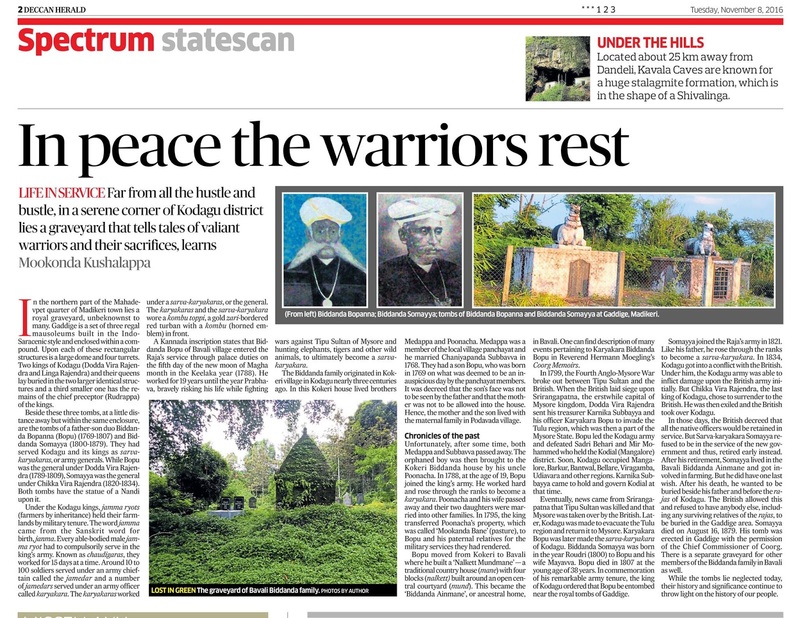 Under the Kodagu Rajas, Jamma ryots ('farmers by inheritance') held their farmlands by military tenure. The word Jamma came from the Sanskrit word for birth Janma. Every able bodied male Jamma ryot were to compulsorily serve in the Raja's army. Known as Chaudigaras, they worked for fifteen days at a time. Around ten to hundred soldiers served under an army chieftain called the Jamedar and a number of Jamedars served under an army officer called a Karyakara. The Karyakaras worked under a Sarva Karyakara, or the general. The Karyakaras and the Sarva Karyakara wore a Kombu Toppi, a gold zari bordered red turban with a Kombu (horned emblem) in front. A Kannada inscription stated that Biddanda Bopu of Bavali village entered the Raja's service on palace duties on the 5th day of the new moon of the month of Magha in the Keelaka year (1788). He worked for 19 years until the year Prabhava, bravely risking his life while fighting wars against Tipu Sultan of Mysore and hunting elephants, tigers and other wild animals, to ultimately become the Sarva Karyakara. He passed away on a Sunday, the 7th day of the Full Moon in the month of Margashira and in the year Prabhava, which is the Kaliyuga year 4909 (1807). Biddanda Raghu Ganapathy took me to his ancestral home in Bavali and provided me with the genealogy recorded by his deceased father and other clan members. The Biddanda family originated in Kokeri village in Kodagu nearly three centuries ago. 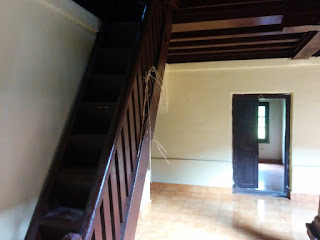 In this Kokeri house lived brothers Medappa and Poonacha. Medappa was a member of the local Panchayat village council and he married Chaniyappanda Subbavva in 1768. They had a son Bopu who was born in 1769 on what was deemed an inauspicious day by the Panchayat members. It was decreed, solely based upon the date of birth, that the son's face was not to be seen by the father and that the mother was not to be allowed into the house. So hence the mother and the son lived with the maternal family in Podavada village. Unfortunately some time later Medappa and Subbavva passed away. The orphaned boy was then brought by his uncle Poonacha to the Kokeri house. Poonacha married a lady from the Mookanda family, sole heiress to a farm in Bavali, and had two daughters. In 1788, at the age of 19, Bopu joined the Raja's army. He rose through the ranks to become a Karyakara. Poonacha and his wife passed away and their two daughters were married into other families. In 1795 the Raja transferred Poonacha's property, which was called 'Mookanda Bane (pasture)', to Bopu and his paternal relatives for the military services they had rendered. 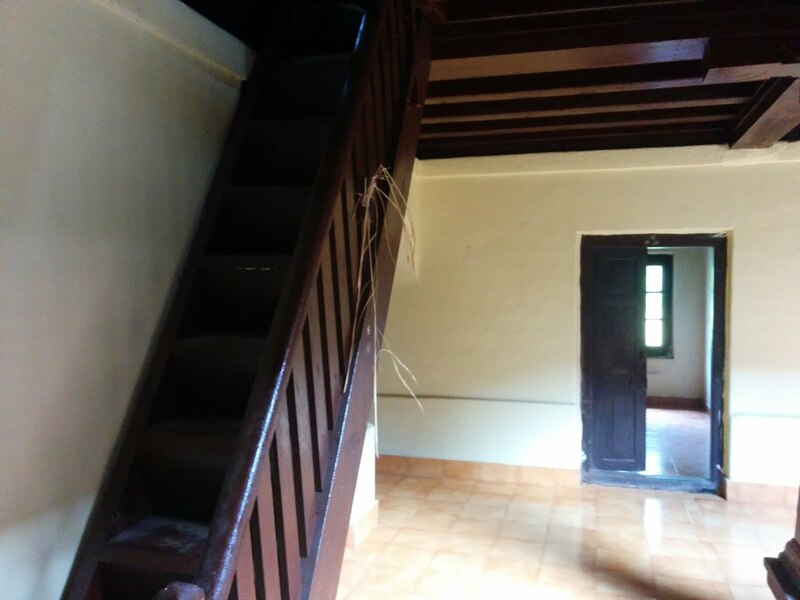 Bopu moved from Kokeri to Bavali where he built a Nalkett Mundmane – a traditional country house (mane) with four blocks (Nalkett) built around an open central courtyard (Mund). 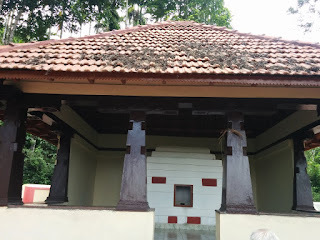 This became the Biddanda Ainmane, or ancestral home, in Bavali. In 1855 Rev. Hermann Moegling narrated events pertaining to Karyakara Biddanda Bopu, in his Coorg Memoirs. In 1799 the Fourth Anglo-Mysore War broke out between Tipu Sultan and the British. When the British laid siege upon Srirangapatna, the erstwhile capital of Mysore kingdom, Vira Rajendra sent his treasurer Karnika Subbayya and his officer Karyakara Bopu to invade and claim the Tulu region, which was then part of Mysore. Bopu led the Kodagu army and defeated Sadri Behari and Mir Mohammed who held the Kodial (Mangalore) district. Kodagu occupied Mangalore, Barkur, Bantwal, Bellare, Viragamba, Udiavara and other regions. Karnika Subbayya came to hold and govern Kodial at that time. News came from Srirangapatna that Tipu Sultan was killed. Mysore was taken over by the British. The war ended and Kodagu was made to evacuate the Tulu region and return it to Mysore. Karyakara Bopu was later made the Sarva Karyakara of Kodagu. Biddanda Somayya was born in the year Roudri (1800) to Bopu and his wife Mayavva. Bopu died in 1807 at the young age of 38 years. In commemoration of his remarkable army tenure, the Raja of Kodagu ordered that Bopu be entombed near Gaddige. Somayya joined the Raja's army in 1821. Like his father he rose through the ranks to become the Sarva Karyakara. In 1834 Kodagu came into conflict with the British. Under Somayya, the Kodagu army was able to inflict initial damage upon the British army. But Chikka Vira Rajendra, the last Raja of Kodagu, chose to surrender to the British. He was then exiled and the British took over Kodagu. At that time the British decreed that all the native officers would be retained. But Sarva karyakara Somayya refused to be in the service of the new government. He said that he had served under the Raja of Kodagu all his life. Hence he didn't wish to serve the British, a new master, and thus he chose to retire early instead. After his retirement, Somayya lived in the Bavali Biddanda Ainmane and farmed his land. However Somayya had one last wish. After his death, he wanted to be buried beside his father and before the Rajas of Kodagu. 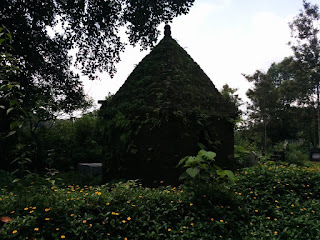 The British allowed this and refused to have anybody else, including any surviving relatives of the Rajas, to be buried in the Gaddige area. Somayya died in the Ainmane on a Saturday, early in the morning of 16th August 1879. 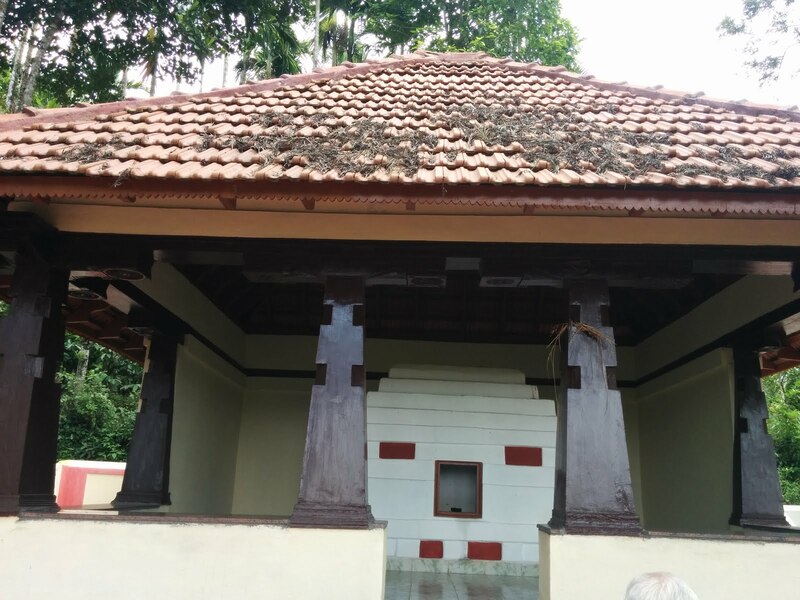 His tomb was erected in Gaddige with the permission of the Chief Commissioner of Coorg. There is a separate graveyard for other members of the Biddanda family in Bavali as well.